Junior project developer Eco Oro Minerals is pursuing a $764-million judgement against Colombia after a court ruling has cancelled exploration over half its concession as part of national efforts to preserve high-altitude wetlands, known as the Páramos. The Vancouver-headquartered company has filed a memorial on the merits with the World Bank’s International Centre for Settlement of Investment Disputes (ICSID) in its arbitration case against Colombia. The document outlines Eco Oro’s version of the facts and legal arguments in support of its claim against the jurisdiction under the Canada-Colombia Free Trade Agreement. The company also argues that it received “unfair” and “inequitable” treatment by Colombia in breach of the treaty, including the frustration Eco Oro’s legitimate expectations and failure by Colombia to provide a stable and predictable legal and investment environment and full protection and security. Eco Oro believes it is entitled to monetary damages calculated on the fair market value of the Angostura project of $696-million, as well as claiming interest to the tune of $68-million. 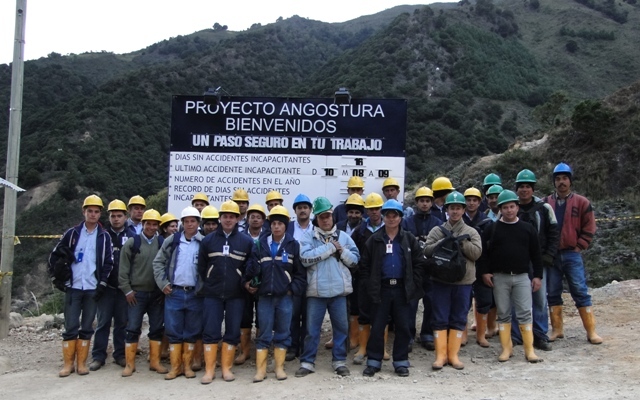 Eco Oro was one of the first foreign mining companies to invest in Colombia’s emerging gold mining sector. The company has invested more than $250-million to develop the Angostura gold/silver deposit into one of the most substantial prospects in Colombia. However, the project is located within the Páramo of Santurbán, which is an environmental reserve to protect areas believed to be the source of rivers and streams that supply water to 2.2-million inhabitants in Colombia. In December 2014, the Colombian government issued Resolution 2090 that delineated the Santurbán Páramo in the vicinity of the Angostura project. Although the resolution restricted mining in the newly designated Páramo, it exempted certain pre-existing mining concessions, such as Eco Oro’s Concession 3452. In August of 2016, the Colombian National Mining Agency (ANM) issued a decision depriving Eco Oro of the rights over the majority of Concession 3452 on the basis of a Constitutional Court decision issued in February 2016. Government, however, failed to dispel uncertainty regarding Eco Oro’s rights over other areas of the concession. This effectively neutralised any benefit Eco Oro could obtain from the project. Subsequently, in November 2017, a further decision by the Constitutional Court overturned the whole of Resolution 2090 and required that the Santurbán Páramo be redelineated. Eco Oro does not expect this process to be complete before November and noted that it will likely lead to increased restrictions on mining. Meanwhile, Eco Oro has an impending deadline to submit a mine plan to the ANM. Failure to do this will mean Concession 3452 will be subject to termination by the ANM. However, given the ongoing uncertainty as to where Eco Oro can pursue mining activities within Concession 3452, if at all, Eco Oro warned that it has no basis upon which to create any plans. Bizarrely, the government has refused to grant Eco Oro a suspension of its deadline for submitting plans, rendering the entire Concession 3452 in a state of paralysis and facing potential termination, Eco Oro warned. A preliminary economic assessment (PEA) study completed on the project in March 2012, had estimated the project to hold 2.7-million recoverable ounces of gold equivalent comprising 90% gold. The PEA called for an average yearly production of 269 000 oz of gold equivalent at a rate of 6 000 t/d and would have a ten-year mine life.